A popular theme used by software groups in creating exciting slot games is the ‘cops ‘n robbers’ genre. 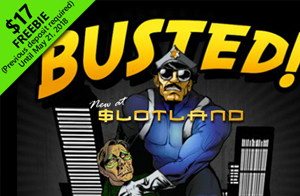 Now, the innovative online casino, Slotland Casino has given its own twist to these theme by launching a superb new slot, Busted. With its fast pace, tried and tested theme and lots of rewards potential, Busted slot promises to be a welcome addition to Slotland’s growing portfolio of proprietary slots and video poker games. To celebrate the launch of Busted slot, the online casino has launched a selection of generous introductory bonuses. The bonuses below will be available between May 15th and 21st, 2018. Use the bonus code 17FREEBIE to receive this bonus. Please note that a previous deposit is required in order to claim this bonus, which comes with a 27 x wagering requirement and a 7 x maximum cash out requirement. Deposit anything between R310 and R3700 on Busted to earn a 120% bonus. Use the bode code NEWGAME to claim this bonus, which has a 35 x wagering requirement. Spin on Busted slot during the promotion period and put yourself in line to win prizes worth R33,000! The 25 players who make the most spins on this game will receive cash prizes worth up to R4,400. Make a deposit of between R500 and R3,700 using Bitcoins, Bitcoin Cash or Litecoins, using the bonus code CRYPTOCOINS, which comes with a wagering requirement of 35x. Deposit between R310 and R3,700 using the bonus code 77EXTRA to claim a 77% deposit bonus. This offer, which comes with a 24 x wagering requirement, can be claimed twice a day during the promotion period. Deposit between R310 and R3,700 using the bonus code 40EXTRA to claim the 40% deposit bonus. The wagering requirement on this offer is 18 x and it can be claimed twice a day during the promotion period.